IN-N-OUT BURGER sues local Las Vegas tire and auto repair company for trademark infringement. On November 20, 2007, In-N-Out Burgers (“INOB”) (supposedly a California corporation although the Nevada Secretary of State (link here) shows the company as a domestic corporation rather than a foreign corporation qualified to do business in Nevada) filed a lawsuit against In & Out Tire & Auto, Inc. (“IOTA”) in the U.S. District Court for the District of Nevada. See In-N-Out Burgers v. In & Out Tire & Auto, Inc., Case No. 2:2007cv01556 (D. Nev.). A copy of the complaint can be downloaded here (courtesy of myself). INOB’s complaint alleges trademark infringement under federal law (15 U.S.C. §1114) and Nevada law (NRS 600.430), unfair competition under 15 U.S.C. §1125(a) and Nevada common law, and dilution under Nevada law (NRS 600.435). According to the complaint, INOB was the first drive-through hamburger restaurant in the United States – opening in 1948 – and continues to focus its business on drive-through business and does not choose locations that would “not be conducive to the drive-in culture and experience.” INOB currently has over 200 locations throughout Nevada, California and other states in the southwestern United States, with apparent plans to expand its restaurant operations in those and to other states. INOB has ten restaurants in Nevada – seven of which are in Las Vegas. INOB holds several federal trademark and service mark registrations on the mark IN-N-OUT including restaurant services, hamburgers & cheeseburgers, French fries, and even watches, decals, mugs, and shirts (but not for anything relating to car repair services). Furthermore, INOB also holds two Nevada state trademarks on IN-N-OUT BURGER FOUNDATION (290274 and 290275). And while not mentioned in the complaint, INOB also holds several federal registrations for the mark IN-N-OUT BURGER. The complaint also asserts that INOB has been engaged in financially sponsoring auto race cars since 1985. While the complaint cites to three service mark registrations that supposedly describe the goods or services as “Financial Sponsorship of race cars and race car drivers,” only one of the actual registrations cited states as such – and its status is currently dead See Registration No. 2,291,183 for IN-N-OUT BURGER (and design). The other two LIVE registrations cited are both for “charitable fundraising and distribution of funds” (IN-N-OUT BURGER FOUNDATION CHILDREN'S BENEFIT and IN-N-OUT BURGER FOUNDATION) and not specifically directed to “race cars” as the complaint would have one believe. INOB appears to be arguing that its drive-through operations, its “car culture business model,” its promotions which sell apparel featuring cars, and its “extensive” sponsorship of race cars create a close enough association between INOB’s marks and the “automobile culture in Nevada, California, and throughout the country” that INOB is entitled to claim trademark rights over its mark with respect to anything automobile related (or, at least, auto repair services). 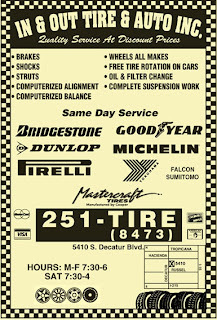 Defendant IOTA operates a tire, automobile, and truck repair service center in Las Vegas. The corporation is owned by Shahram and Maria Mashoud. Some of INOB's seven Las Vegas locations are apparently a close drive away from IOTA’s business location. The primary issue, of course, is IOTA’s name, specifically the words IN & OUT. INOB alleges that IOTA’s name is a “colorable imitation” of INOB’s marks and is likely to cause confusion as to the affiliation of IOTA with INOB and as to the origin, sponsorship, or approval of IOTA’s services by INOB. In addition to IOTA’s choice of name, INOB does not like IOTA’s advertisements. IOTA has apparently been advertising its name in bright yellow lettering on a brick red background or with the words IN & OUT in brick red block letters alongside brick red arrows. INOB infers that these ads are meant to resemble INOB’s registered marks where “In-N-Out Burger” is in brick red letters superimposed over a bright stylized arrow or where “In-N-Out Burger” is superimposed over a bright yellow stylized arrow on a brick red background. INOB also alleges that IOTA’s use of its name in such advertisements misrepresents the nature, characteristics, qualities of IOTA’s services. INOB sent a cease and desist letter to IOTA, but thus far IOTA has refused to stop using the name. The complaint’s only request for relief is a permanent injunction against IOTA from using its name. To summarize (without sounding too critical), INOB is attempting to expand the scope of its well-know IN-N-OUT mark to cover products/services that have nothing to do with restaurant services on the grounds that consumers associate the IN-N-OUT mark with INOB’s drive-through restaurant services (and how else do you drive-through a drive-thru except in a car) and with INOB’s sponsorship of car racing. It would appear that most of the Sleekcraft factors for likelihood of confusion would favor IOTA. While INOB certainly has a strong mark, the goods and services are not closely related (INOB’s activities remotely related to cars, such as its sponsorship of a race car, does not mean that consumers identify the mark in connection with such car related activities and certainly not car repair services). Additionally, the marks are only remotely similar (the IN & OUT portion) and, when viewed in their entireties, are dissimilar (especially given the additional words TIRE & AUTO appearing in IOTA's name). INOB’s complaint does not cite any actual confusion, but surveys may show otherwise, so this factor is inconclusive. Given the type of services involved in IOTA’s operations, most patrons exercise a strong a degree of care before having repairs done on their car. I doubt people will see IOTA’s advertising and rush in to get new tires from the company because they like its “burgers.” As for IOTA’s intent in selecting the mark, it is obviously meant to be suggestive of the expediency at which IOTA performs its tire and auto repair services – and not meant to create an association with the burger chain. Finally, I doubt that INOB has any legitimate plans to expand its products and services into the tire and auto repair business (car sponsorship notwithstanding). Unfortunately, IOTA is a small business and may not want to bother fighting this out in court with INOB. Given that IOTA only has a single location, changing the name would probably be less arduous and less expensive than litigating the case through summary judgment – because I do not see the case going much further without stronger evidence from INOB. this case seems unintelligent on in 'n' out burger. iota is a small business while inob is a huge coorporation. there have been list of other companies related to in 'n' out even comapnies that sell burgers. this is an auto repair shop. its a waste of time and money especially for the small business. i have been to iota and the owner is caring and nice and just wants the job done. the colors isnt his choice its the people who own that land. if you couldnt tell all the other companies around it hacve the same colors too. I really think in n out burger has gone to far. I think IN-N-OUT lost the case, because IN & OUT TIRE still operates and they did not change or modify their name at all.